Agincourt Reef is the true Outer Reef experience. Only Quicksilver takes you to a reef activity platform where you can fully experience this most pristine ecosystem at the renowned Agincourt ribbon reef, acclaimed as amongst the most spectacular in the world. Here at the true Outer Barrier Reef, water clarity and visibility are at their best all year round. Clear, blue water every day! Quicksilver was the first company to visit the outer reef daily so we chose the very best location! 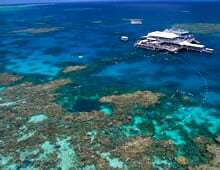 – we’re still the only reef activity platform on the magnificent ribbon reefs at the very outside edge of the Great Barrier Reef. Ideal for all types of clients from divers to non-swimmers, whether you want to get wet and swim with the fish – or stay dry and get a diver’s view from our semi-submersibles! With the most modern fleet of the unique wavepiercer designed vessels, we make your ride to the reef as smooth and fast as possible as the twin hulls pierce through the waves. If you’re traveling from Cairns or Palm Cove you can see one of the most spectacular scenic coastlines in Australia by luxury coach transfer. Our qualified marine biologist share their love and knowledge of the reef with you! Multi language activity sheet available.